Multipletau provides a multiple-τ algorithm for Python 2.7 and Python 3.x with numpy as its sole dependency. Multipe-τ correlation is computed on a logarithmic scale (less data points are computed) and is thus much faster than conventional correlation on a linear scale such as numpy.correlate(). The source code of multipletau is available at https://github.com/FCS-analysis/multipletau. The multipletau package should be cited like this (replace “x.x.x” with the actual version of multipletau used and “DD Month YYYY” with a matching date). autocorrelate(a[, m, deltat, normalize, …]) Autocorrelation of a 1-dimensional sequence on a log2-scale. correlate(a, v[, m, deltat, normalize, …]) Cross-correlation of two 1-dimensional sequences on a log2-scale. correlate_numpy(a, v[, deltat, normalize, …]) Convenience function that wraps around numpy.correlate() and returns the correlation in the same format as correlate() does. Autocorrelation of a 1-dimensional sequence on a log2-scale. This computes the correlation similar to numpy.correlate() for positive \(k\) on a base 2 logarithmic scale. normalize (bool) – normalize the result to the square of the average input signal and the factor \(M-k\). dtype (object to be converted to a data type object) – The data type of the returned array and of the accumulator for the multiple-tau computation. 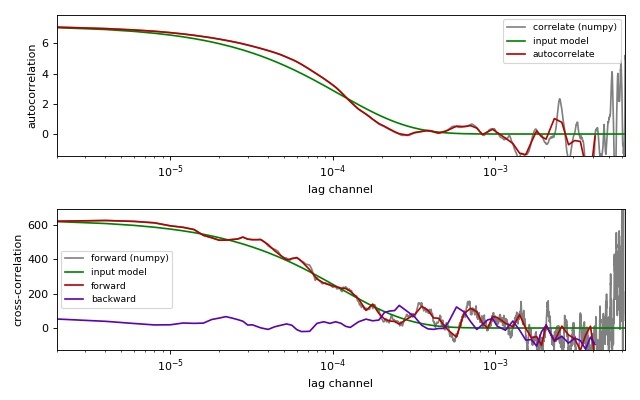 autocorrelation – the lag time (1st column) and the autocorrelation (2nd column). Changed in version 0.1.6: Compute the correlation for zero lag time. The algorithm computes the correlation with the convention of the curve decaying to zero. For experiments like e.g. fluorescence correlation spectroscopy, the signal can be normalized to \(M-k\) by invoking normalize = True. For normalizing according to the behavior of numpy.correlate(), use normalize = False. For complex arrays, this method falls back to the method correlate(). Cross-correlation of two 1-dimensional sequences on a log2-scale. This computes the cross-correlation similar to numpy.correlate() for positive \(k\) on a base 2 logarithmic scale. Note that only the correlation in the positive direction is computed. To obtain the correlation for negative lag times swap the input variables a and v.
cross_correlation – the lag time (column 1) and the cross-correlation (column2). Changed in version 0.1.6: Compute the correlation for zero lag time and correctly normalize the correlation for a complex input sequence v .
Convenience function that wraps around numpy.correlate() and returns the correlation in the same format as correlate() does. normalize (bool) – normalize the result to the square of the average input signal and the factor \(M-k\). The resulting curve follows the convention of decaying to zero for large lag times. dtype (object to be converted to a data type object) – The data type of the returned array. cross_correlation – the lag time (column 1) and the cross-correlation (column 2). Changed in version 0.1.6: Removed false normalization when normalize==False . © Copyright 2013, Paul Müller Revision e03b0032.